Stories from people worried about losing access to affordable health are pouring in from across the state. As details of the plan to repeal the Affordable Care Act become more clear, so do the consequences. The bottom line is that people in Congress know that Trumpcare is a bad deal. A vote on the bill in U.S. House of Representatives was delayed twice. This is good news for Arizonans, especially those living in Yuma, which would have been among the cities hardest hit by the Trumpcare fallout. Yuma residents would lose about $7,815 every year in health care costs. The deal the president put on the table was particularly bad for older people and those living in rural areas. For example, a 60-year-old person in our state could lose up to $6,720 in tax credits. Also, in some cases, those living in rural areas could increase costs so much that some people's plans could exceed their annual income. Trumpcare was likely going to bust our budget. Within the first year, it would have caused a $663.3 million budget shortfall while 413,000 Arizonans would have lost Medicaid coverage. At the same time, it would have severely impacted our economy by causing 33,900 Arizonans to lose their jobs, including 10,500 in the health care sector. The folks who would benefit a great deal were the super-rich. 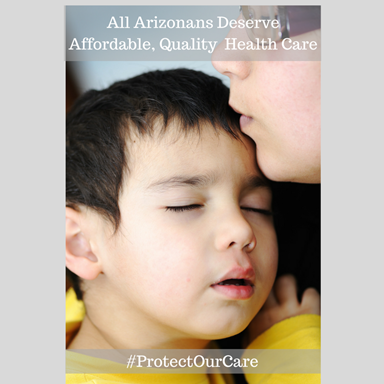 That was tough to sell to Congress last week – the push back in Arizona alone was loud and clear. The president says he wants to move on from this debacle. But we must stay connected and involved. This bill is still on someone's desk – don't stop making your voice heard on this matter. 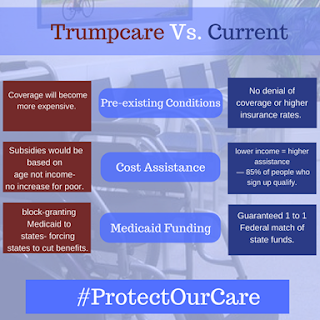 We have fought too hard to lose our access to health care. Let your state and federal elected officials know that you want them to #ProtectOurCare.